You know those awful romantic comedies where two would-be suitors accidently bump into each other and form an instant mutual dislike before eventually realising that, gosh, they actually have a huge amount in common? 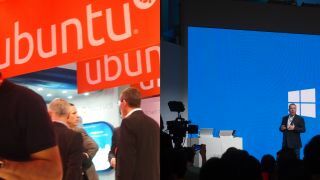 That's what I feel I've just seen at MWC 2015, though instead of a beautiful American actress and a bumbling and foppish British guy, we have the less than glamourous Ubuntu and Windows starring as the star-crossed lovers. Microsoft and Canonical, the companies behind Windows 10 and Ubuntu, have been showing their visions for putting desktop operating systems on mobile devices. I met up with both here in Barcelona, and came away from the latter with a tremendous sense of déjà vu, as the two companies seem to have far more in common than they (and their supporters, especially on Ubuntu's side) would like to admit. Both have acknowledged that desktop PCs are a dying market, though Microsoft won't directly admit it, instead offering token support for desktops by bringing the Start menu back to Windows 10. Canonical is far more forthright, with Cristian Parrino, Vice President of Mobile and Online Services at Canonical, straight up telling me that "PCs are a fading market". They're doing that stereotypical rom-com thing: despite the way they say it, they're both saying the same things. They mutually want desktop apps to work on mobile devices, though where Canonical says "convergence" in a rather unsexy way, Microsoft says "unified" like an emotionally-stunted Vulcan. Both want their app stores to be the hip place to download your software, and both will have to come to terms with the fact that that will probably never happen. And what's a romantic comedy without the comedy? During my demo of Windows 10 for Phones the enthusiastic Microsoft representative brought up Cortana to search the web. The top search that was displayed? "I don't like my Cortana", something that grated with the head-bobbing-but-ultimately-there-for-the-cash Surface-toting DJ smashing out the bangin' tunes in the background. Ubuntu was going down the opposite route, trying to appear smart, crisp and respectable... while failing to hide its rough edges with plenty of bugs and crashes during my demo.